JACKSONVILLE, Fla. (Jan. 18, 2017) – With the onset of a new year comes a renewed desire to get healthy and stay active. To help injured veterans in the Jacksonville area with their resolutions, Wounded Warrior Project® (WWP) recently hosted a physical health and wellness expo focusing on nutrition and physical fitness training. Participants at the event enjoyed yoga, weight training, seminars on healthy eating, and TRX (Total Body Resistance Exercise) training. The resistance training was a highlight for Navy veteran Geraldine Manalo Forbis. To emphasize the importance of overall lifestyle changes to improve health, participants also learned about the basics of proper nutrition and maintaining healthy habits. The seminars were hosted in a casual setting, offering warriors a chance to ask questions and chat with staff about their health concerns. 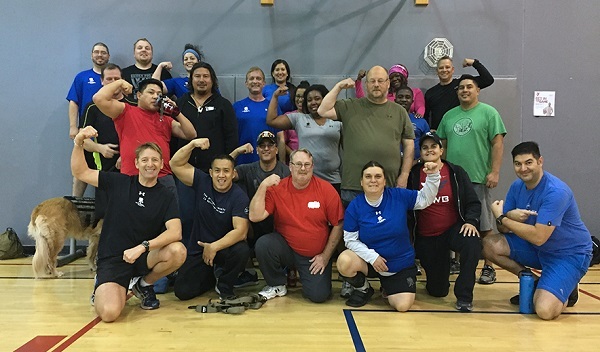 The program was available to veterans of all fitness levels, and coaches offered technique modifications to make sure warriors’ needs were met – no matter where they were in their recoveries. Geraldine felt encouraged as she saw warriors helping one another stay motivated. “Gathering with warriors – especially from different services – who struggle with some of the same difficulties allowed me to feel like I was on a team again and that I could lean on others to raise me up when I'm down,” Geraldine said. After the training, there was one more surprise for Geraldine and the other warriors to help them maintain their physical fitness goals.